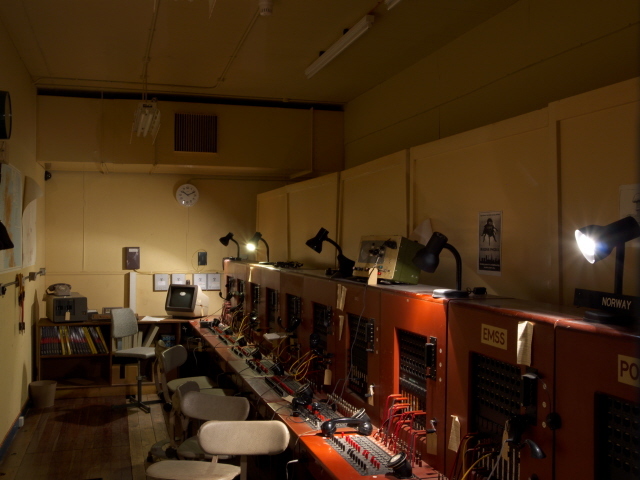 A no longer quite so secret former government nuclear bunker in Scotland, Great Britain, that has been opened to the public to serve as a kind of Cold War museum. More background info: Like other such installations this bunker was a regional government relocation facility, intended for the worst-case scenario, namely if World War Three ever broke out. Its official title was 'Central Government HQ for Scotland in the event of a nuclear war'. Quite explicit. 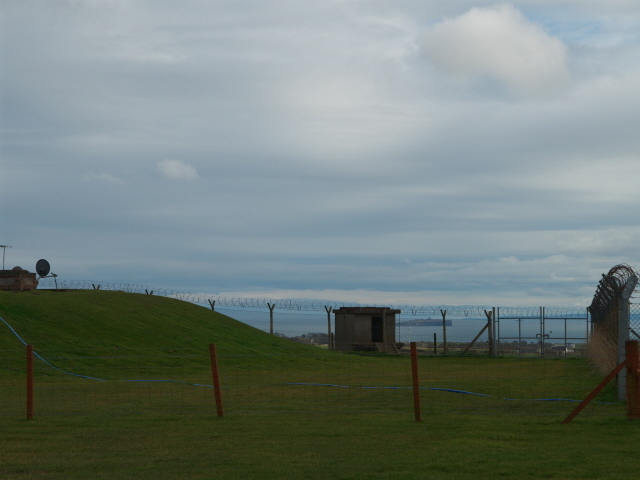 The bunker as such was originally built in 1951 as an early warning radar station run by the RAF. It then became a Civil Defence Corps base before assuming its main Cold War role as a standby emergency government command centre in 1968. As such it would have housed some 300 staff, including the Secretary and Minister of State for Scotland. Originally there had been three separate government HQs in Scotland, but the other two fell victim to “streamlining” (cost-cutting) over the years. So this bunker eventually remained as the only such site in Scotland. 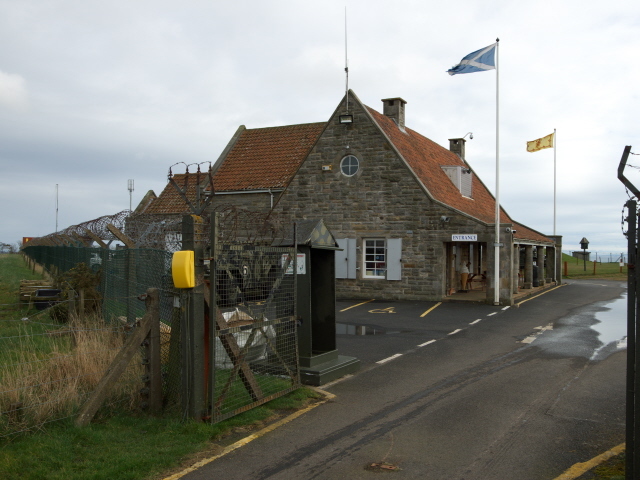 All communications for Scotland between governmental branches, the military and police would have gone through this command centre. 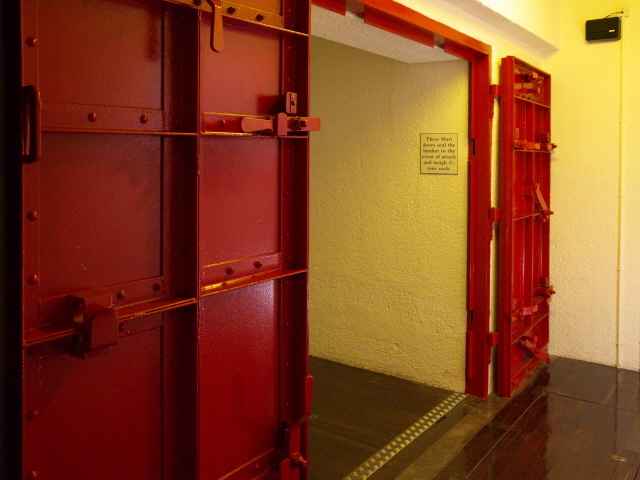 The bunker is 100 feet (30m) below ground and is further protected by up to 15 feet (5 m) thick reinforced concrete. The whole structure sits in a bed of gravel, intended to serve a giant shock absorber. The bunker and its role were officially kept top secret until it was decommissioned in 1993, following the perceived end of the Cold War. Soon after it was put up for sale and was sold for something like 70 grand. It was opened to the public in 1994. Part of the technology and furnishings are original, only a few upgrades were necessary (e.g. the fire alarms), and extra artefacts not originally from the bunker were added to the exhibition. Now an established local tourist attraction, the bunker is well signposted – which gives many people giggles, seeing something allegedly “secret” so overtly signposted. For more background info on the nature and history of such bunkers see under Hack Green and Kelvedon Hatch (and also cf. The Greenbrier). What there is to see: quite a lot. Even before you go down into the actual bunker. On open-air display on the lawns around the bunker are several military vehicles, including a couple of tanks and, especially noteworthy, a Soviet Cold-War-era anti-aircraft SAM (surface-to-air missile), complete with its red star markings. The topside building above the bunker entrance was built to look as inconspicuous as possible, just like a regular countryside farmhouse – although the barbed-wire fence, the aerials and other installations visible above ground do detract from the camouflage quite a bit. Inside the house you get to the ticket counter and museum shop where you not only pay your admission fee but also have to decide whether or not to hire the additional audio guide on offer (for an extra charge – but I can't remember how much). I declined, partly because I'm not especially fond of these machines, and partly because they get in the way of photography. So I don't know what and how much the audio guide would have added, but I found the visit without the audio guide already extremely rich in information, so I have my doubts whether it could really offer so much added value (instead of just information overload). On entering you first come to the long underground corridor that connects the topside entrance building with the actual bunker (so the building is not actually sitting on top of the bunker itself – presumably as an extra safeguard). A little playful addition I spotted was a plastic rat placed on top of the cable conduit along the yellow walls. At the end of the corridor it makes the usual bend to the side (as a blast deflecting measure) and then you step through the steel blast doors into the bunker proper. Along the way you pass a dummy guardroom with dummy guards. 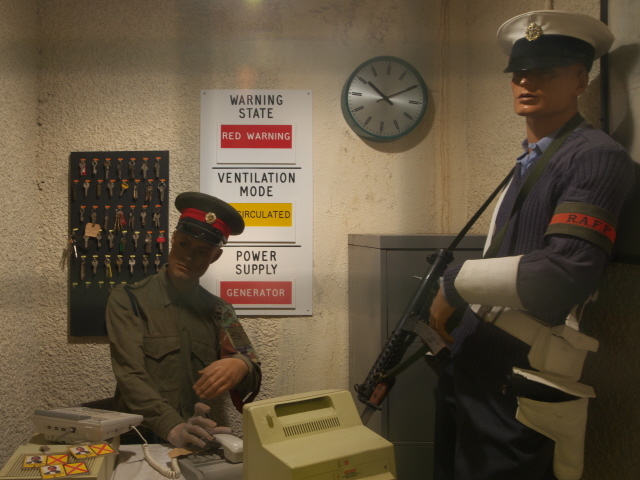 You arrive at the upper floor of the two-storey bunker, and branching off the central corridor are various rooms, including the main dormitory, the canteen (converted into the museum cafe), a medical room and the BBC recording and broadcasting studio that the bunker was equipped with too. 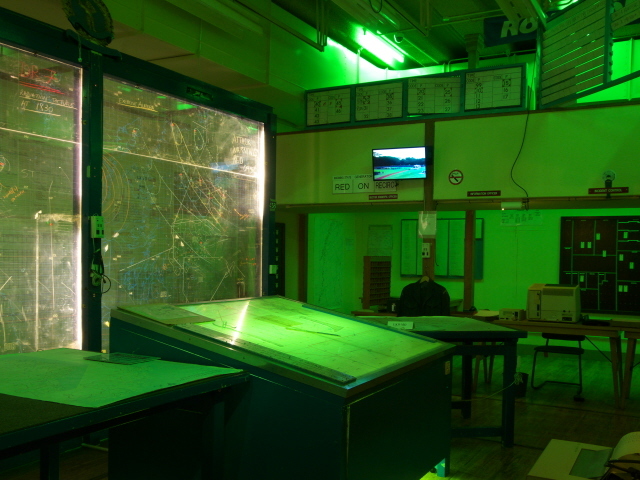 Opposite is the Royal Observer Corps operations room, illuminated in eerie green light. Text panels, photos and other information material lines the wall in many places. It is a bit haphazard but there's plenty of valuable info, including a summary of the development of the Cold War in general and plenty of specific bunker-related details, charts, and newspaper clippings. Some of the latter are evidence of the fact that the public did know about the existence of the bunker (despite the official secrecy) and many people were not happy about it – asking why should a select elite be saved when the rest of us get vaporized in a nuclear holocaust. Fair point. Here and there, video screens have been mounted onto walls and columns too. Playing on these is mostly period footage, just in the background, so not for actually following any particular content. At the end of the corridor there's a special room with a possibly surprising angle (in such a Cold-War-“nostalgic” place), namely the SCND Room. The abbreviation stands for Scottish Campaign for Nuclear Disarmament and there's plenty of material here, both historic and current. For example, they make strong case against the government's plans for replacing Britain's fleet of nuclear armed submarines with their Trident missiles, all at immense cost. All of these would be stationed on the River Clyde in Scotland (west of Glasgow), even though the vast majority of Scots and practically all Scottish politicians are against it. Next door are two (!!) cinema rooms. Here you can sit down and properly watch films relating to the topic of the Cold War and the nuclear threat. In cinema1 the film “War Games” (46 minutes) is shown, in a loop, while in cinema 2 screenings of two Public Information Films alternate: “Advice to Householders – Nuclear Explosions Explained” (from 1975, 21 minutes running time) and “Protect & Survive” (from 1960, 32 minutes running time). As I was under a bit of time pressure I gave them a miss – also because I had already seen parts of these films elsewhere. Instead I proceeded to the downstairs level. The main thing down here is the Central Government Command & Control Nuclear Operations room. The Minister of State had his own elevated office overlooking the main ops room through big windows. Various branches of government had their own little corners down there. In the back you can spot two red receivers of the “war telephone”. In the adjacent rooms you can see the antique-looking telephone exchange switchboards and vintage teleprinters, as well as somewhat more modern late-1980s computer equipment. 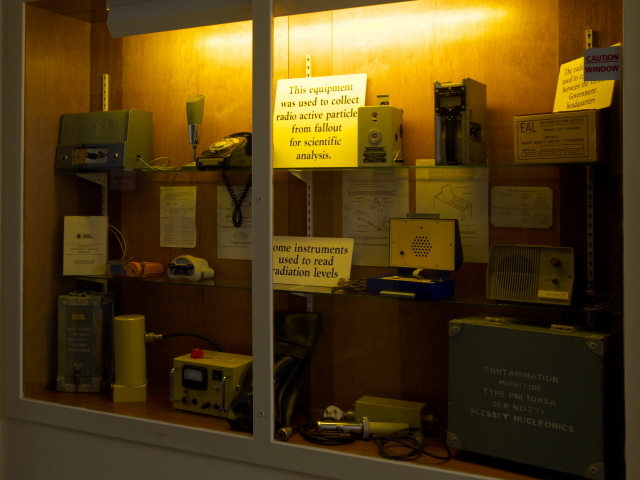 In the main corridor there's a display cabinet with various old dosimeters (Geiger counters). On the wall are boards with paper clippings with more or less famous quotes from the Cold War period. One small side room is full of weapons. These include not only various machine guns but also full-scale howitzer shells. Why these are down here I have no idea. Part of this bunker level has been restored to its 1950s look when the bunker was an RAF radio station. 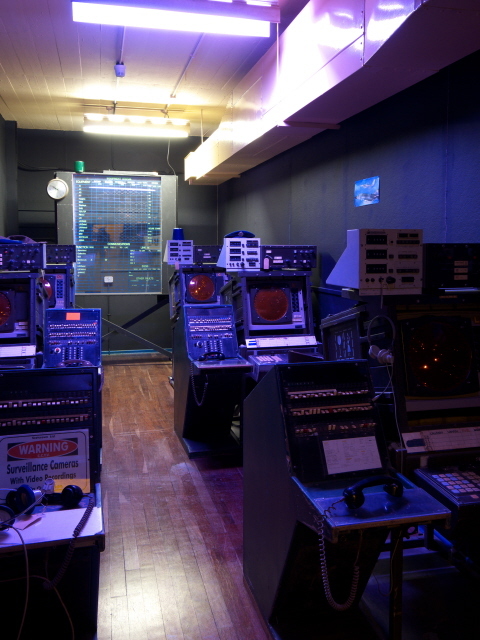 One room is stacked to the brim with radar screens and other equipment and illuminated in an eerie purple light. Next to it is the old RAF operations room, complete with one of those tables with a map on which little symbols and arrows were shoved about and in the back are some “tote boards” that gave information about the status of aircraft and defence systems. You can also see the plant room with original machinery that secured the bunker's electricity supply and air ventilation. One large room is crammed full of a plethora of vintage communications gear. It's a cross between a separate museum and a jumble room. Also only partially connected to the main theme of the museum is a room with a mock-up of a GDR border machine-gun emplacement and a veteran motorcycle. Back at the bottom of the staircase you are invited to grab one of the vintage uniforms provided in a wardrobe and pose for photos with an assortment of different equipment. Fans of selfies will be delighted. I hurried past all this quickly. Back through the approach tunnel and up in the topside building you can have a look around the small shop. There are only a few items related to the bunker or the Cold War as such (mainly things like T-shirts or coffee mugs with their logo on), the rest is rather the usual general souvenir range. All in all, I found this a pretty good version of the formerly-secret-nuclear-bunker theme. Compared to Hack Green and Kelvedon Hatch, this one in Scotland had more information overall, even if the presentation is a bit disorganized. Not that I minded that so much. Some of the equipment is quite cool to look at. But I think on that front Hack Green is ahead of this Scottish counterpart. A remarkable aspect was the room with the anti-nuclear-weapons campaign. You don't get that very often at such former military sites. Overall, for those with an interest in the topic of the Cold War and nuclear weapons, this bunker site can be wholeheartedly recommended. For others it may be a bit too specific and they may find looking at stuffy rooms full of ancient electronic equipment rather boring, whereas I quite enjoyed it. This is also why I went on my own, while my wife gave it a miss (sounds like a typical male vs. female cliché, but it's true). Location: in Troywood, a few miles south of St Andrews, East Fife, Scotland, Great Britain – just off the B940 road to Crail. Access and costs: quite remote and hidden, but no longer so difficult to find (by car); relatively expensive. Details: The only really feasible way of getting to the bunker is by car (or bike), there is no public transport directly to the site, though there's apparently a bus stop about a mile (1.6 km) away with connections to St Andrews and Anstruther (presumably on the B9131 – the bunker's website does not specify this, and I didn't see any bus stop markers by the roadside, but Google maps marks a bus stop at the intersection with the B940, the road that leads to the bunker). To find it by car you can follow the signs from St Andrews (or even from the M90 motorway much further west). Or enter the address/postcode into your GPS: Troywood, St Andrews, Fife, KY16 8QH. There is a large free car park at the site, and even two complimentary charging points for electric vehicles! Opening times: daily from 10 a.m. to 5 p.m., but only seasonally between 1 March and 31 October. Admission: 12 GBP, concession (students, seniors, military, police, carers) 11 GBP, children (up to 16 years old) 8 GBP. Time required: depends. I spent about two hours in the bunker, but I did not use the audio guide nor did I watch the film screenings on offer. If you want to see, watch and read it all, you probably need at least half a day. Combinations with other dark destinations: Nothing much in the more immediate vicinity – but see the Scottish entries under Great Britain in general. However: Dundee, Scotland's fourth-largest city, just to the north of St Andrew's and Fife across the Firth of Tay does have a few dark aspects. First of all there are the remnants of the old Tay Bridge. This original railway bridge collapsed in a storm on 28 December 1879 taking a passenger train down with it. All aboard the train perished. A new, sturdier bridge was soon built in its stead, but you can still see the stumps of the old bridge's columns poking out of the water parallel to the new bridge. In Dundee itself I found a peace memorial with a plaque dedicated to local members of the International Brigades who fell during the Spanish Civil War fighting fascism. I wouldn't have expected this up here so far away from Spain. But Dundee also has links to places much, much further away still: Antarctica! In the harbour, Captain Scott's “Discovery” has been turned into a museum piece. This ship had been built in Dundee and Scott had used her on the British National Antarctic Expedition at the beginning of the 20th century (though not on his fateful terminal one). Finally, the Verdant Works Museum in Dundee allows a glimpse into the city's industrial heritage in the form of a jute mill, including the dark aspects of working class life at the peak of the Industrial Revolution (the mill was built in 1833). Combinations with non-dark destinations: The biggest general tourism draw in the area will be St Andrews, famous for being the “home ground” of golf, as well as for its posh university. I only drove through the town, but I got the impression of a really pretty and atmospheric coastal town that would have been worth exploring a bit (but I couldn't as I was under time pressure). Nearby Dundee (see also above) may not be particularly high on most tourists' wish list, but it is trying to attract more visitors and new developments are on their way. A definite tourist must-see, on the other hand, is Edinburgh to the south – and in particular the bridge leading there from the north: the world-famous Firth of Forth Railway Bridge, often called “Scotland's Eiffel Tower”, a marvel of engineering and one of the most iconic bridges in the world (cf. Golden Gate). Head west and north from St Andrews, though, and you get into the Scottish Highlands. The Cairngorms in the centre are amongst the highest mountains in the British Isles. Further north, south-west of Inverness, is the famous Loch Ness. But rather than falling for this rather pathetic tourist trap I'd recommend heading further west instead and working your way up the Scottish west coast – one of the most splendid sceneries in the world (see top 10 landscapes ).